The Belt and Road Forum for International Cooperation opened in Beijing, China on May 14. The event was attended by high-level leaders from 29 nations, the United Nations Secretary General, the President of the World Bank (WB), the Director General of the International Monetary Fund (IMF). The Vietnamese delegation was headed by President Tran Dai Quang. The two-day forum, under the theme “Belt and Road: Cooperation for Common Prosperity” will have the Leader Roundtable, and high-level dialogues among ministers, enterprises and scholars. 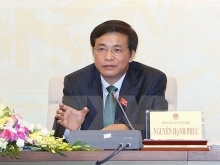 Minister of Industry and Trade Tran Tuan Anh is scheduled to join the discussion about trade connectivity; Minister of Planning and Investment Nguyen Chi Dung will attend the talks on policy connectivity; and President of the Vietnam – China Friendship Association Nguyen Xuan Thang will participate in the dialogue on people-to-people exchanges. Addressing the opening ceremony, Chinese President Xi Jinping said China will pour an additional 100 billion CNY (US$14.5 billion) into the Belt and Road initiative. According to the National Development and Reform Commission of China, the country’s investment in projects related to the initiative has totaled US$60 billion since 2013. Most of China’s upcoming overseas investment will go to the initiative’s member nations. Once completion, the Belt and Road Initiative is expected to create a large economic and trade network, covering a region with 4.4 billion people, the combined GDP of US$21 trillion. The forum will close on May 15 with the release of a Joint Statement of the Leader Roundtable.